Our experience with the snorkeling with mantas on the Big Island was a little different from the stories already on this page and I think even more encouraging for the novice or never snorkeler. The Sea Paradise Tours catamaran extends a long floating scaffolding off the boat, which resembles a big, long ladder with pool noodles and lights. The snorkelers get into the water and just work their way away from the boat while holding on to the scaffolding. I don't think we even had fins. So there was no swimming in open, dark waters and kids as small as 7 or 8 were out there too. Even by the crew's opinion, we had an extraordinary outing with 5-8 mantas swimming within inches of us for at least 30 minutes - it would have been longer if they had kept the lights on. Check the weather. Rough seas might not affect the mantas, but it would definitely make for a less pleasant experience. We went in December when the waters can be rougher, but lucked out with a really calm night. The water temperature was around 75°F and the company provides spring suits (short sleeved and legged wetsuits). I am used to surfing in California and I was too hot in the wetsuit, but others were shivering so it really depends on what you're used to. With the weather and mantas cooperating we had a great time. Book your trip for a day early in your stay so you can redo if no mantas are seen. They will take you out again for free if you don't see any mantas. A couple of tips: They ask that no shoes are worn on the boat so be prepared to leave them on the dock. When you go into the water, it's first in - last out, so if you want to be in the water for the maximum time, sit at the front of the boat. I've told people about this and they've "chickened out", but it really is an amazing and safe thing to do. Hi Gary, this sounds like a great new option for snorkeling with mantas at night on the Big Island. Thank you for sharing it with all of us. Are they harder to see in the day? Plankton are drawn to light, which in turn draws mantas to feed. So it's a matter of getting the mantas to come to a predictable spot which makes it more likely (easy) that you will see them. The story we heard was in the 80's, a night club next to the water would shine their disco lights into the water. People then realized it attracted mantas. Soon after, tours were set up so that anyone could go out and watch them. This is definitely something you should try, but sightings are not guaranteed. We used Jack's Diving Locker which was great for me (a diver) and my husband (a snorkeler). It is an amazing experience that leaves you speechless (as diver or snorkeler) if you are lucky enough to have the Mantas show up. Hubby and I did the manta snorkel last year. It was awesome!!! We did it as a result of this site several years ago and it was great. Well worth the money. Last trip in September 2016 found us at Mauna Kea and in the bay at 2pm with 2 mantas that decided to swim there. It was amazing and wonderful. Can't plan on it though. But did have that experience there. I went night snorkeling with the Manta Rays on the Big Island. I am a beginner snorkeler and very much afraid of deep water. I knew that it was the thing to do from watching all the various videos and reviews. I did practice with a snorkeling vest in a swimming pool a couple of times prior to the trip. These practice sessions showed me how very little air I had to use to keep afloat (3-6 breaths) with hardly any indication that the vest had any air in it. My wife, who is a better swimmer than me, was very reluctant to go. She never took the time to practice with the vest and she just didn't like the idea of snorkeling at night in the ocean. Our particular tour (Coral Reef) limits the number of participants to 6, which also helped to make us feel at ease. The ring they provided was about 4 ft in diameter, with the lights mounted in the center. The captain anchored about 25 yards away from the other boats, which numbered about 10. We were at the Kona Airport site. Once we entered the water, we did not swim toward the other groups, but toward a private boat that was also anchored away from the others. 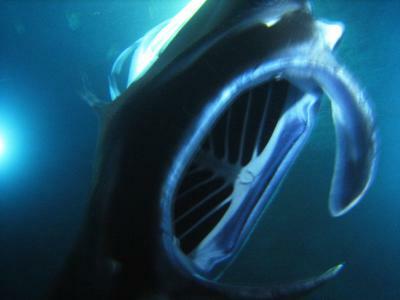 It was amazing that the mantas came to our light first, three very large ones. We had these mantas to ourselves for about 10 minutes, when our guide started moving us toward the large group which was about 40 yards away. The manta followed us as we made our way toward the others. It is like everyone described, it is really a once in a lifetime experience, we were mesmerized by how graceful the mantas swam past, under and around us. With all the lights it was like an underwater stage show. During the course of the evening, about a total of 11 manta rays showed up. We stayed in the water for about an hour. My wife has not stopped talking about this to all her friends and keeps stating that it was the best tour in our lifetime. 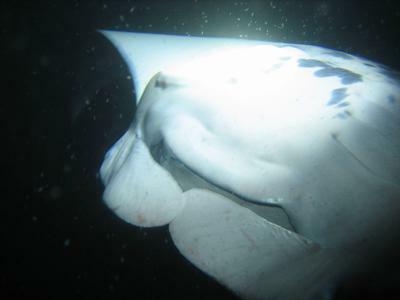 Wow, your very first time snorkeling and you go on a night snorkel with Manta Rays?! You are braver than us. It took us years to get the courage to snorkel at night. Thanks for the nice story. We got some pictures and videos we share along with our story of night snorkeling with the manta rays. Yay!!! Isn't it just THE most amazing experience ever???!!!! Oh, and folks, being in the water at night and all, it is really not scary like you might think. All you do is float on the surface on your tummy holding onto a floating hoop. Your guide is right there, as well as the others with you. It truly is a once in a lifetime experience! So glad you decided to do it! I still get chill bumps when I think about it! If it's a full moon sometimes the Manta Rays don't show because the plankton is abundant everywhere. We went to several hotels where they shine the light in the water and didn't see any. It's best to go on a tour where they know the mantas will come to. 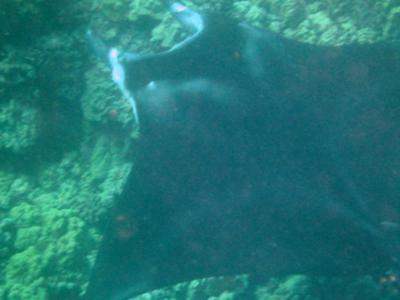 Hi Galen & Nicole, can you suggest a tour company for Manta Ray snorkeling on The Big Island? You mentioned you were close to the airport but didn't say which company you used or if you knew of a better one. Thanks. If you read a little more on the page you will see that we used Sunlight on Water like Cary did. We liked them. The other stories on this page mention what companies they used and how they felt about them. Hope you enjoy your snorkel! We took the night manta snorkel trip on the Big Island September, 2011. It was absolutely the most surreal and awesome experience we have ever had!!! If you get to the Big Island, don't miss doing this. We went with a company called "Sunlight on Water", Capt. "China" Mike and his wife are truly dedicated to what they do and have a very deep and spiritual connection with the dolphins and creatures that inhabit the waters there. I highly recommend them! They also have a swim with the wild dolphins trip that was very thrilling and spiritually moving! On that trip we also saw mantas on the reef during the day at the "cleaning station", slowly cruising along the reef. It was beautiful. For another terrific experience snorkeling, be sure to check out "Captain Zodiac" and take their snorkeling trip to Kealakekua Bay. It was incredibly beautiful!! The water is crystal clear and the reef and fish are stunning. They have a really neat Zodiac that you ride in/on that is loads of fun! You also get to experience the sea caves along the coastline and see the Goddess Pele! It was an unforgettable day. Thanks Cary for your post! We went with the same company. They only take snorkelers which was a plus for us. The night manta snorkel is a very unique experience. They get incredibly close to you and they are so graceful in their movements. It feels like a trade; we shine lights that attract their food and they give us the show of our lives. Awesome!